God has shown His grace, His provision and His heart to me time and time again at Pathway. I came to Pathway as a very lost little girl— pursuing whatever it was that could make me feel loved. I didn’t know what I was really getting into, but I know that Pathway meant stability for me, and I would have done whatever it took to get through those doors. I learned about Jesus every Sunday— His character, His grace and His crazy love for me. I got plugged into our then “youth bible study” and had leaders who cared for me, prayed with me and encouraged me. I quickly began to make friends and realize that life is so more abundant in community. And everything slowly started to click. About a year after coming to Pathway and attending bible study, I met Jesus on June 20, 2011 at a camp Pathway students attended. Everything clicked into place for me. I had new friends who loved me, I knew Jesus died for me, and I was ready to take over the World. And that was only the starting point. Year after year— our church continued to grow and I was growing right along with it. Week after week, Pastor Marty challenged me (and still does!!) to grow deeper in my faith and take my next steps. 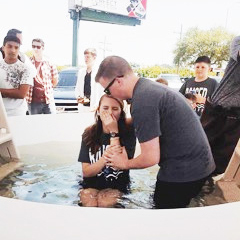 Starting with becoming a Switch Student Leader to serving on a Dream Team and being baptized, every next step drew me closer to Jesus and deeper into a loving family. Eight years later, God has shown Himself crazy faithful time and time again. I am now a Switch leader, a part of the Switch teaching team, a small group leader and serve on the Pathway Kids Dream Team. Next step after next step, I went from being a lost little girl to a woman found in Christ. At Pathway, God has set me free, restored my heart and given me a place where I am safe to be myself. Better yet— Pathway has given me the family I was always searching for. There will never be the right words to say what Pathway has really meant to me and how God has totally changed my life here, but I can tell you that walking through the front doors will always feel like coming home.